In my last position as a marketing manager for a small manufacturing company, I was charged with lead generation. It was the first time in my career that I was directly responsible for it. In the other industries I had been in, that responsibility fell to the sales or business development department. It was really my first opportunity to directly influence lead generation. It didn’t take me long to realize that the status quo approach was not producing the results necessary to grow. I started to conduct research to help me identify the most appropriate way for a small, B2B manufacturing company to generate leads. That research led me to inbound marketing. I was fascinated by the concept. The methodology, as a whole, re-lit my passion for marketing. The more I learned, the more I wanted to be an inbound marketer. I read everything I could find. I attended the only inbound “boot camp” in Wisconsin. I started networking with and talking to the few agencies in the area that called themselves inbound marketers. One of those agencies held a contest and the winner received a ticket to HubSpot’s Inbound 2014. I won that contest and then paid my own expenses to attend. And I was not disappointed. I returned from Boston with an even greater desire to be an inbound marketer. The only trouble was that the small manufacturer was not as convinced as I was that inbound marketing was the way to go. If I wanted to be an inbound marketer, I had to find a different opportunity. At almost exactly this time last year, I met Imagine Business Development and the rest, as they say, is history. Doug and Fletch gave me an opportunity to shift from inbound marketing student to inbound marketing practitioner. To date, it is the best professional decision I have made. It has been an exciting year filled with applying the things I learned as a an inbound student, learning how to use my traditional marketing skills within an inbound environment and most importantly, developing a true understanding of what it takes to move a prospect from content downloader to paying customer. Reading about inbound marketing and actually implementing it are very different things. For those of you thinking about adopting an inbound strategy or changing your career path to focus on inbound, here are the three most important things I have learned this year. All marketers, no matter what they call themselves, create content and we’ve been doing it forever. Content is the raw material for any marketing approach. For more than 10 years, I provided marketing services for the consulting engineering industry. We created a lot of content – case studies, proposals, infographics, more org charts than anyone should ever create, technical papers, brochures, sell sheets, video…the list goes on and on. So while I wasn’t a stranger to content creation, I was not accustomed to the aggressive schedule. Take blogging, for example. I had not been a contributor to a blog in the past. I wrote sections of quarterly newsletters. I had never been responsible for a blog that published three times per week. At first, managing the blog content alone was overwhelming. And then there’s premium content. Keeping up with the content needs of our prospects and those of our clients is hard work…and it doesn’t have a hard stop…it is ongoing. When one piece is done – and sometimes before it’s done – it is time to start the next one. So if your ready to take the plunge into inbound, prepare to change your approach to content creation. It requires your undivided attention for at least part of every day. Doug wrote a post about the Field of Dreams concept with inbound marketing. And I have to admit, I believed that concept until I began to practice it for real. Basically, inbound marketing sells itself as a better, friendlier way to attract your buyer personas. If you provide them with the content they need to find answers to their questions and evaluate their purchasing options on your website, they will buy from you. Well, it doesn’t exactly work that way in real life. First of all, it takes time and a great strategy to create enough of the right content to attract the right prospects to your site. And even with a great strategy, your buyer personas may not flock to your content. Or you may think you have created the best piece ever and it turns out that no one wants to download it. There are a lot of other things that have to happen to move your buyer personas from downloader to customer. Creating great content is less than half the battle. Successful inbound marketers spend as much time promoting their content, tweaking their SEO approach and nurturing leads as they do creating content. All of the pieces of the puzzle need to be working together. Shoeless Joe and the other guys aren’t just going to show up. Before I joined Imagine, I was an outbound skeptic – at best. Every outbound effort I had been a part of sucked. In fact, I had personally spent hours in Hoovers looking up SIC codes and handing company names and contacts over to sales reps. You can guess the amount of success that yielded – none. I was annoyed by any mention of any kind of outbound approach. Additionally, I felt like the inbound methodology proved that outbound was not the way to go. Boy, was I wrong. One of the first pieces of Imagine content that I read was our How to Effectively Manage Inbound Leads whitepaper. It covers lead classification, service level agreements (SLAs), follow-up emails and connect CALLS! Wait…calls? I thought the whole inbound methodology was to take the interruptive tactics away – no one wants to be bothered with phone calls. Why does our whitepaper have a section on making calls? As it turns out, calls are vitally important to actually turning inbound leads into revenue. And I’m not the only person who had (has) this false idea. Sales development is really the partner to inbound marketing. The two together are what turn downloaders into customers. This post called, The Third Discipline, is my favorite Imagine post of 2015. If you haven’t read it, you should. This is probably the most important thing that I have learned this year. Inbound marketing by itself does not drive growth. Sales development by itself doesn’t either. It takes a holistic approach to drive revenue. Around here, we call it an all-bound approach. I hope the lessons I learned this year help you. I have learned more in the past 12 months than I had in probably the five years prior to that. 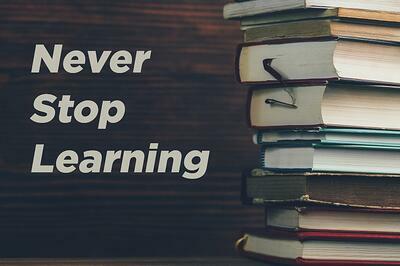 My lesson to you is to never stop learning, never become complacent and always be open to a new or different concept.